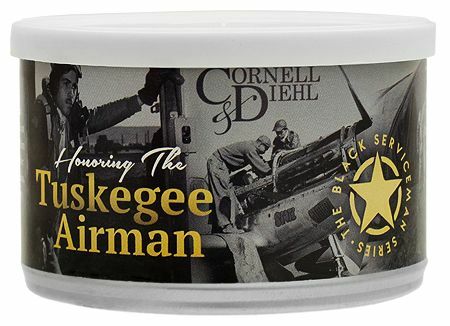 Cornell & Diehl salute's America's first Black military aviators: the Tuskegee Airman. The vibrant colors of their P-51's and their heroism earned them the nickname "Red Tail Angels" from the bomber crews they escorted into battle. A blend of Virginias, Perique, Turkish, and Latakia, pressed to marry flavors, then sliced for easy packing.